A man has been arrested on suspicion of murder by detectives investigating the death of the grandson of The Specials singer Neville Staple. 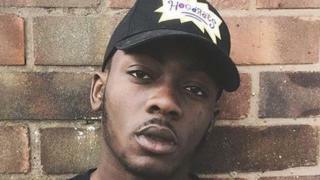 Fidel Glasgow, 21, died after being stabbed outside Club M in Coventry on 1 September. He was the son of Mr Staple's daughter, Melanie. A 23-year-old Coventry man was arrested on Monday and has since been bailed. Police are appealing for witnesses.